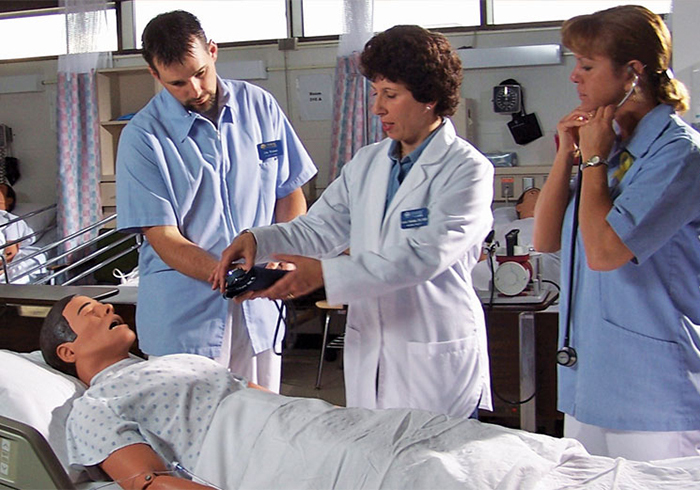 Genesee Community College nursing students training in a hospital setting. In repeated surveys, today’s generation of students claim that they value the college experience, the opportunity to learn and the social interaction — but they also regard their college years as an investment. The Value of College report, conducted last year by MONEY and Barnes & Noble College, revealed that 90 percent of students considered the role of “preparing for a fulfilling career” as a valuable benefit of a college education. That gap between high expectations and the hard reality of a student unprepared for the world of work has spurred the development of both institutional programs and public policies to increase college readiness and create a more highly skilled and qualified competitive workforce. Faced with a growing skills gap, employers are partnering with community colleges to provide students with the education needed to succeed in today’s work force and the specific hands-on skills to land a job. A closer partnership between students and potential employers is happening at Onondaga Community College, where local business leaders are no strangers to the campus. “It’s an opportunity for them to have conversations about the kinds of skills and qualifications they’re looking for, and the chance for our students to start the networking process,” says Jess Abbott, who manages the college’s bookstore. Part of the State University of New York (SUNY) system, Onondaga, located in Syracuse, N.Y., was a recipient of the Department of Labor’s Trade Adjustment Assistance Community College and Career Training (TAACCCT) grant in 2015, and it’s been put to good use through a variety of programs that helps train students for future careers, among them is the With Love restaurant. “It’s a teaching restaurant for every student who attends an OTC food service program here, and it gives those students real-life, hands-on experience,” Abbott explains. Also part of the SUNY system, Genesee Community College (GCC) serves four different counties within the State of New York, with six extension sites and a robust online learning program. Partnering with Western New York High Schools, the college has developed Accelerated College Enrollment (ACE) Programs to provide college courses to secondary students during the school day. These programs provide an opportunity for students to enroll in college level courses and earn college credits from Genesee Community College while still in high school. The college also offers The Best Center, a technologically advanced skills screening facility. “It’s very community facing,” explains Konopa, “and those who might not even be enrolled can take various training programs such as CPR, computer skills, Red Cross training and Drivers Ed classes,” she adds.